After MIA’s action-packed 2010, which included both the commercial release of /\/\/\Y/\ and the mixtape Vicki Leekx — the latter, arguably her best work since Arular — the lightning rod that is Maya Arulpragasam has been fairly low-key (the stunning “Bad Girls” video notwithstanding). It turns out she’s been working on her next album, Matangi, in India and London with Switch and others as well as doing the theme song for Wikileaks don Julian Assange’s new television show. So how did you wind up working with Beck’s? Things have their way. I was in India at the time doing artwork anyway, and somebody sent it to me, and it kind of fit with the theme of what I was making. And so I said yes because I felt like it was perfect. I didn’t really peg you for a beer drinker! 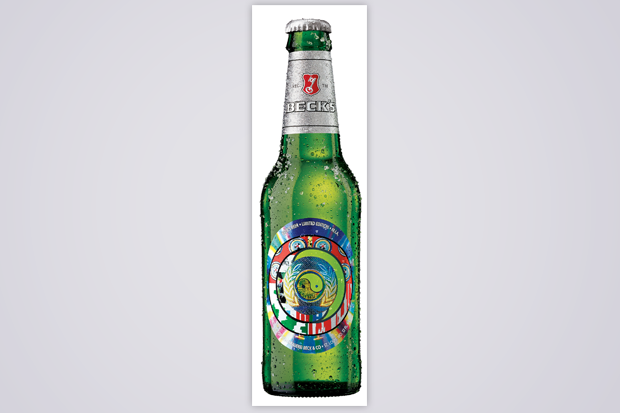 I’m not too much of a beer drinker, but when I was at art school, Beck’s always sponsored shows and stuff like that. I remember it being like a beer haze, not for me, but for most of my friends. You developed the whole label design? Yeah, I was making that as a painting, or with those elements anyway, and I put together a version for them out of what I was making for myself at the time. What kind of paintings were you doing in India — digital paintings? Yeah, I’d been doing Vicki Leekx and then I ended up playing Australia. As soon as I finished I just wanted to take some time out and get back to visual arts and do other things. My trip to India was to kind of explore the visual arts thing a bit more and while I was there I was coming across lots of things that were inspiring and I was recording initial bits of drums and things like that for the record — just because I was there and I was inspired to do that. But I didn’t 100 percent think I was just gonna make a record. I just wanted to get there and explore it without having to be pressured about making the record, you know? But they also go together all the time — it’s really hard for me to separate the two out. Where in India did you go? Chennai’s the main place that I go to, because I speak Tamil. It’s the closest place that I can get to Sri Lanka without actually having to go there. You said your art goes hand in hand with your music-making, which makes sense. What’s your next album going to sound like? You’re gonna have to wait and see! I’m trying to work that out every day, just working out the album. You don’t know until it’s done! Art-wise in India, were you inspired by contemporary Indian art, or? I was inspired by some sort of new, something abstract. A new beginning. It was important to go there and start fresh, just letting go of everything. You get attached to what you were inspired by before and finding inspiration in what it is. It’s not really like how I made Kala, like hey, I’m recording in Africa, I’m recording in India. It was more about a state of mind; I just wanted to go be somewhere it was really interesting to see this crazy, booming side of India where it’s making tons of money, and you still have something really like, broken and sort of displaced. Because I was going there to see the refugee camps where the Tamils are. It was just sensory overload, where I got maxed out with being a human. And was that also about having the space to work out your album? Yeah, that’s kinda what I was saying about working on the art, just giving time to whatever it is you’re doing and letting it develop by yourself. Can you tell me a little bit about making the “Bad Girls” video? It’s just drawing on everything I said on the /\/\/\Y/\ album, and Vicki Leekx was an extension or a part to the whole /\/\/\Y/\ thing. I feel like I put out two albums, which is hard to do. Subject matters that I was talking about hadn’t happened yet at the time that I made it, it took a year for things to happen — for the Arab Spring to happen, for Wikileaks, all these things, it was all in my mind. What were you thinking when you were doing all of that, being engaged with internet culture and how it dovetailed with Wikileaks? I don’t know what I was thinking. So much has happened since. People remember from what you’ve done last, of course, but your life’s like every day, it’s difficult to remember what that moment was like, you’re just doing it. It was so strange that no one else was doing it, which is why everyone was like Why is this so off on a different tangent, and therefore it must be crazy. But it’s just sad that not a lot of artists comment on what’s happening right now. Can you talk about who you’re working with for your new album? I’ve been working on the songs by myself for awhile, and towards the end I got Switch to sort of bring it together and contribute new songs for it as well, but also just help me pull mine together so it’s a bit more like… well, it’s just nice to get another opinion. But I’m trying to work with tons of people, I don’t really wanna say any names because I haven’t actually chosen what songs are going on it yet. Right. It’s sort of a weird time to be interviewing you right now. It is! This is for the Beck’s thing! I’m not really doing interviews on my album right now, I want to get everything in order first. So back to Beck’s. Have you been going to pubs? What do you do for fun in London? Nobody goes to the pub! [Laughs] That’s what making a record is for me, that’s the fun bit. I do music stuff for fun. It’s not really sitting around in a pub. I’m not going to say anything controversial in this interview. I’m not trying to ask you anything controversial, I just wanted to ask you about your art reaching a larger audience through Beck’s. Have you thought about that? Yeah, before artists would struggle with the art and commerce thing, but now I think you have to have a certain conviction about your work and I think the canvas is irrelevant, you can put it on anything these days. As long as you’re not like, you know there are certain things I won’t agree to, but sitting down and having a drink, and having a little chat is a good thing, and that’s what people tend to do, you know. They get drunk and get together, so. Your style is so specific artistically, and recognizable as a generational thing so it’s sort of cool to see in a more mainstream context. Also, it’s just like, it was like five dudes [doing the] labels and it was like getting that feminist perspective. I just wanted to make something that was like, an evolution of the design stuff but still part of what I did before kind of thing.